Holy Rosary College developed from Scoil na Coróine Muire, a Girls’ Secondary School founded in 1944. The all girls’ school was started by the Sisters of the Holy Spirit and Mary Immaculate, an American congregation, who had come in 1934 to Mountbellew where they established St Philip’s Convent in “Bellewsgrove”, the former dower-house of the Grattan-Bellew estate. This Georgian building housed both a convent and a school for 21 years. Many of the girls joined the congregation and moved to the Novitiate in San Antonio, Texas. The number of students in the school ranged from 45-55. In 1965, Archbishop Walsh, in response to requests from the people of Mountbellew, asked the Sisters to admit boys to the school. However, the Congregation was not interested in developing a co-ed school and decided to withdraw from Ireland. A memorial plaque commemorates “the many women who went from here to serve the poor and marginated in the USA, Mexico and Zambia”. The Sisters of the Christian Retreat were originally a French Congregation, founded by Fr Anthony Receveur in 1789, the year of the French Revolution. The name of the Congregation expressed the aim of their founder – to bring back an alienated world to God and religion through reflection, prayer and retreat. From an original group of lay people, a religious congregation had emerged, committed to Christian Education. During the Revolution the congregation was evicted from France but they set up convents throughout Europe. In England they had several houses and schools. Many of the Sisters who joined the Order in England were Irish. 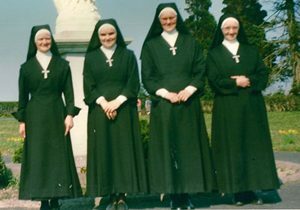 The Sisters of the Christian Retreat came to Tuam in 1959 where they looked after the Boarders in St. Jarlath’s College. The Congregation had been looking for a suitable house in Ireland in which to establish a novitiate and when the Mountbellew Convent and school became available, they decided to purchase the property. In September 1965, the school, now renamed Holy Rosary College, entered a new era when it became a co-educational school with the admission of 27 boys. The total enrolment that year was 79. Sr. Dympna Stack was Principal, a position she was to hold for 25 years. The extra pupils needed extra space and the basement of the Convent / School and outbuildings were brought into use for classrooms. It was clear that a new building was required to cater for the growing enrolment. In 1966 a new pre-fabricated block containing 3 classrooms and the school’s first Science Lab was built – without any Government grant. A Post-Leaving Cert (PLC) Secretarial Course was also introduced in 1966 . 1967, L-R: Sr. Bernardine Kennedy (later Sr. Veronica), Sr. Assumpta Collins, Sr. Dympna Stack, Sr. Bridgid O’Keeffe. 1967 saw the introduction of the Free Education Scheme, probably the most important social policy decision ever taken by an Irish Government. Numbers increased dramatically and there were now 209 pupils in the school, compared to the 49 who attended in 1964. Three more pre-fab classrooms were added. It was now necessary to provide a permanent school building to accommodate a growing enrolment and an expanding range of subjects. Department of Education approval was obtained and architects were appointed to prepare plans. In 1970, Stage One of the building was completed with the opening of a two-storey block containing 2 spacious and fully-equipped Science Labs, 2 Home Economics Rooms for Cookery and Sewing, a Library, Staffroom, Offices and Cloakrooms. The Dept. paid 75% of the costs leaving 25% to be raised by the school. In 1972, Stage Two of the building programme, the West Wing was completed. This consisted of seven new classrooms, Geography Room, Art Room, and cloakrooms. 1977 saw the opening of Stage Three of the new building, the East wing. This provided 4 extra general classrooms, a large General Purpose room, Kitchenette and Showers. The permanent buildings meant that the “temporary” pre-fab classrooms could now be used for other purposes. Three of them were converted in 1977 to provide Woodwork and Drawing Rooms and the Leaving Cert subjects, Construction Studies and Technical Drawing were introduced in 1978. In 1979 Physical Education was introduced as part of the Curriculum and the school’s first Computer Room was provided in 1986. In 1991 Stage Four of the building programme, a Technology Block with several specially equipped rooms for Woodwork, Drawing & Construction Studies was opened. New offices and an extended staffroom were added and the Sisters of the Christian Retreat paid for a Chaplain’s Room to be included in the new extension. As pupil numbers continued to grow, eventually exceeding 600, three more general classrooms were added in 1993 and a further extension containing two classrooms, as well as a Technical Drawing and AutoCad room and toilets was built in 1997. Over the years new courses and subjects have been added to the school’s curriculum. In 1991, HRC introduced the Leaving Cert. Vocational Programme (LCVP) while the Transition Year Programme (TY) has been running since 1998. German was also added to the curriculum in 1988 while Art and Music were extended to the Leaving Cert. Programme in 1995. HRC has always recognised the importance of Science Education, offering Mathematics, Agricultural Science, Biology, Chemistry and Physics to Leaving Cert Higher Level. In 2003, the Dept. approved plans for 4 temporary pre-fab classrooms. This allowed the school to finally vacate the Old Convent building, formerly “Bellewsgrove”, which housed classrooms for almost 60 years. The Sisters moved to a new residence in Mountbellew. In 2007, the Sisters of the Christian Retreat transferred the school property to CEIST (www.ceist.ie) who are now the Trustees of HRC. In 2011, new Changing Rooms for PE & Sport were completed. The Sisters moved to a new residence in Mountbellew and made their former convent available for use by the school. The Staff has increased in numbers from the original 3 to the current 50 as HRC continues to develop, providing facilities and programmes to suit the needs of students to-day. 2016 saw the completion of a new major extension to the school which includes 6 extra classrooms, specialist rooms for Art, Music, Business, IT, Religion, Languages, and a Sports Hall with a Fitness Suite and stage. . The older parts of the existing building were also refurbished as part of the project. A history of Holy Rosary College 1965 – 2015 by Dr. Gabriel O’Connor is available from the school office.